Review: "Mamiffer: Mare Decendrii" - Sea of Tranquility - The Web Destination for Progressive Music! Made up of Faith Coloccia, Aaron Turner, and Travis Rommereim Mamiffer has made leaps and bounds in the musical world. Not only is Mare Decendrii an awesome listening experience, but it gets better after every listen. The album features spooky riffs and an almost avant-garde/ black metal fell, yet it isn't metal at all. The music feels like a dark side of Tangerine Dream in parts, yet with more guts. The guitar work is excellent, and is what pulls this album along. The slow laid back feeling of the album is absolutely excellent and makes you want to listen more. Through the mostly instrumental album there are hardly any spots in which you aren't kept acutely aware of the complex feelings put into the music. This shows perfectly, especially on 'As Freedom Rings', where the keyboards and guitars mix greatly in complex melodies. The drums on this album are also quite good, though they are used sparingly. The lack of drums on the album adds to it, actually, because it adds a different feel to the album. What's great about this album, though, is that every song is different. Granted they all have the same feel to them, but each one has its own unique style that adds flavor and interest to the album. Talking of each song having its own style, the album has no vocals except for the chant-like vocals on 'We Speak in the Dark'. This is a nice touch that I really enjoy. All the songs, except 'Blanket of Ash', are well over 10 minutes, and there is some times a feeling that it gets a little long, but other than that every thing is great on this album. The production is fine except for a little mishap during the first song, but it was very minor so it didn't matter that much. Since the album is mostly focused around synths, keyboards, and guitars it is important for those to sound good together and they sure do. 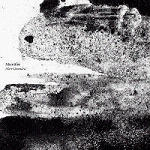 Mare Decendrii is a great album, with great instrumental music from Mamiffer. Featuring a sludge metal feel, minus the metal, this album can be a bit out there at times but is well worth a listen. For a great release Mamiffer gets 4 stars.